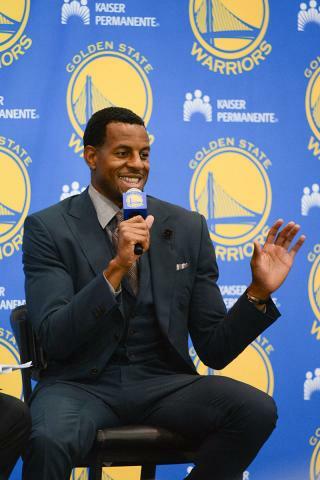 Andre Iguodala came to Oakland Thursday bearing a box full of invigorating new expectations. The issue that comes with him is in understanding what’s in the box. Put another way, after three full decades of NBA irrelevance, the Warriors have fought to be real players. Now that they are, we'll see how well they play. 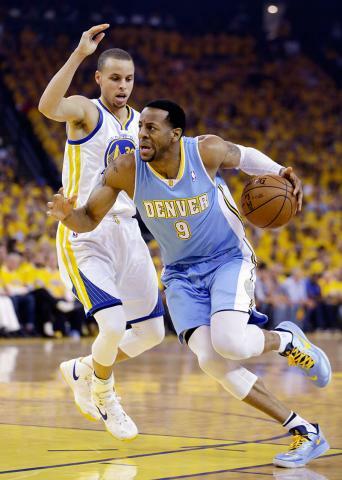 Iguodala was the Warriors’ prize for playing so hard and well in the Dwight Howard Sweepstakes. General manager Bob Myers said, “I thought 15 different times this wasn’t going to happen,” almost to a point where he seemed to be saying that the Warriors thought they had a better shot at Howard. The point is, they asked, and they were not immediately rebuffed. And Iguodala ended up being a sufficient enough prize for Myers to call it “a transformative moment in the history of the franchise.” He said that would have been the case based only on Iguodala’s stated desire to come west, but in the real world, almosts are the same as not reallys. Deals aren’t deals until they are closed. And Iguodala is the deal they made. The Warriors could have ended up with that hot mess of a Howard-Being-Howard-For-The-Benefit-Of-Howard situation and wisely passed on it. That’s how they seized upon Iguodala, at the cost of Jarrett Jack, Carl Landry and a lot of expiring contracts on expiring players. That is all to the plus for the Fighting Sleeves. But as Iguodala was being introduced Thursday, it became equally clear that what the Warriors have today is actually not a new team, but a different kind of the same team. It is an ensemble cast with Stephen (“Second Coming Of Jesus Christ” re: Iguodala’s description) Curry as its central character, and only the 2004 Pistons won a title with no discernible Hall of Famer since the 1979 Seattle SuperSonics. Modern NBA orthodoxy, which the Warriors have tried to fly in the face of for two-and-a-half decades, says that superstars win titles, and that the magic number of superstars to get a title is two, plus a really good third. A superstar, for purposes of this discussion, is someone who at some point will be a Hall of Fame finalist, if not an actual Hall of Famer. The Warriors do not yet seem a championship-caliber team, but barring bad health should be in the argument for a place in the Western Conference finals. And even with bad health, they would be a team in transition. Iguodala is an interesting part of that transition in that he is still a premier, if no longer an elite defender, and he is still a slasher on the offensive end – two things the Warriors have in short supply. He is also used to not being the alpha dog, as he could not be that in Philadelphia with Allen Iverson and Denver didn’t have one in his one year with the Nuggets. In other words, he is a very helpful part of a coherent whole – a whole that emanates from Curry, envelops Iguodala, David Lee, Andrew Bogut and Klay Thompson, and has satellites in Harrison Barnes, Toney Douglas, Marreese Speights, Jermaine O’Neal, Draymond Green and Kent Bazemore. They are a rationally built and relatively deep team. In other words, they are an upgraded version of this past season’s team, and have no relationship at all to those before that. Iguodala said all the right things all the right way, if you are the type who grades press conferences. He even covered the fans in a unique way, right down to citing the energy he took from them when the Nuggets were making a run in the fourth quarter of Game 6 of the playoff series. That’s a unique take on it, and one that sounds more sincere than most. But Iguodala is also a pragmatist, as is his agent, Rob Pelinka. The Bay Area might have offered lifestyle and business opportunities for him in his after-ball career, but he had too much game left to waste it on a non-predictor. The Warriors needed to become a good team for this to happen, fans or no, and now with him, that have to make that next and more difficult step. The step to elite-hood. Teams go from bad to good a lot. Good to really good is harder, and really good to great is hardest of all. A realistic view of them puts them in that second group, not quite as good as Oklahoma City or Memphis, but in the high-echelon second tier with San Antonio, the Los Angeles Clippers and the Howards Of East Texas. We know, though, that being fourth in a conference isn’t much better than being sixth. Having concluded the leap from a pro-rated 28 wins to 47, are they ready with this team to take the leap to 57? Are they ready for the leap not to fourth but to second, or even first? We mention this because only seven of the last 76 finalists have been seeded fourth or lower, and the last finalist to win fewer than 50 games either pro-rated or actual is the 1999 Knicks. In short, the regular season matters. And so does the seed. A lot. Thus, the Warriors with Andre Iguodala are in a better position than they have been since the early 90s, maybe even the mid-70s. Either he is as Myers called him, “the last piece of the puzzle” that makes them a title contender, or at minimum it flatters them as a free agency destination. Or they think they can be the ’95 Rockets, and unlike that Houston team which benefited from Michael Jordan’s absence and Orlando’s inexperience, LeBron James isn’t signing with the Miami Marlins. The Warriors may have improved themselves, but they’re not living THAT well yet.